Life after the death of her sister hit Laurie hard. She wasn't ready to deal with it, but had to for her family. Now, she looks a life through a different lens. I was very active in sports throughout high school, but what really motivated me to start bodybuilding was a life-changing event. In 2007, my beautiful 41-year-old sister was diagnosed with an AVM (Arteriovenous Malformation) located in the inner core of her brain. Our family was devastated. She was a beautiful, healthy, fit woman who took great care of herself. She didn't drink or smoke and followed the beliefs and faith of God. Due to the location of the AVM, surgery wasn't an option. The only treatment option was to use localized radiation to shrink the clusters of vessels, which were weakened as a result of the AVM. The doctors believed the treatment was working. However, in 2008, my beautiful sister and best friend passed away. She was an amazing and very inspiring woman. Throughout the pain and suffering, she kept a positive attitude and a beautiful smile on her face. Her strength and the power of her belief in God kept her going to the end. When my sister died, a part of me died with her. My life changed. I slowly and painfully sunk into depression. It was like my life came to a complete stop, including all forms of physical activity. I tried to keep my unhappiness hidden from my family and friends. As a result from the stress and depression, I experienced a weight decrease to 115 pounds and developed Ulcerative Colitis, IBS, and FBC (Fibrotic Cyst Disease). One day, my husband had enough. He came to me in our bedroom, where I would go everyday weeping and said: "Honey, you have got to pull yourself out of this. Your family needs you and your sister would be so upset with you." He was heading to the gym and he asked me to come with him. His words: "Come on, let's go the gym. It'll make you feel better. Take all that anger, guilt, and sadness out on the weights. Then, when you're done, get on the treadmill and run like Forrest Gump. I guarantee you'll feel better." I agreed to go. It felt so good lifting weights and running like Forrest Gump. This is what my sister would've wanted, because fitness is a big part of my life. That's how it began for me. I started going to the gym, working with a trainer, and decided to compete. I competed in my first competition after training for five months in 2011. I wasn't ready. My body was thin, but I had to do it in honor of my sister. My sister loved butterflies, so I had one incorporated into my suit. It felt like she was with me onstage. I didn't care about my placing; it was about overcoming an obstacle and fulfilling a goal. Shortly after the conclusion of my first competition, my husband introduced me to an amazing WBFF pro fitness model and trainer. We started working on my physique and diet. I just finished my second competition in May of 2012 and took third place in the master's fitness model category. I work part-time and have a figure skating daughter, so I plan my workouts around these schedules. I work out in the morning on my days off work and in the evenings when I have to work. 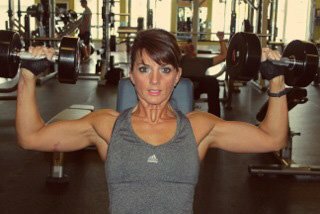 I'm new to competing and I'm a hard gainer, so it's important for me to include strength training in my regimen to increase the load on my muscles and add mass to my frame. I use volume training (higher reps), strength training (lower reps), and incorporate supersets, giant sets, and dropsets. I recently started incorporating CrossFit into my training plan 2-3 times per week. CrossFit workouts are motivating and include strength, cardio, and flexibility training in a competitive group setting. I include CrossFit training in the evenings when I'm able to train in the morning, but no more than 2-3 times per week. I focus on one body part per workout and include abs twice per week. I work out at the gym five days per week. One of my days off from the gym is a CrossFit day. I take one day off completely as a recovery day and mix it up often to confuse my muscles. My program changes every 3-4 weeks. I have a high metabolism, so I limit my cardio workouts to three times per week for 30-45 minutes during the off-season. My nutrition plan is very simple and clean. I'm very limited in what I eat. My food has to be wheat-free and gluten-free. I'm working to build mass and below is what my typical meal plan looks like. I feel privileged to be healthy enough to train and compete. It's something I'll never take for granted. When I look back at where I was two years ago and look at how much I've changed physically and mentally, it amazes me. I'm proud of how far I came. I set myself up for a challenge each month. By the end of each month, I want to lift a certain amount of weight or master a certain exercise. This month, I managed to get my deadlift up to 165 pounds. By the end of next month, my goal is a 200-pound deadlift. I learn something new at the gym and at CrossFit each week, which I just started with my 16-year-old daughter. My new lifestyle helped me overcome obstacles, strengthen my outer and inner self, and helped me maintain and improve my well-being. I love what I do and it will be a part of my life as long as air flows through my lungs and my heart keeps beating. Fitness is intoxicating. I love it. Motivation has to come from within. My motivation comes from life, family, friends, and the pursuit of improved health. I'm motivated every day by my family. My daughter is an amazing figure skater. When I watch her perform it blows me away. When she has a bad fall in front of an audience and judges, she gets up, smiles, and keeps going. It motivates me to never give up on life or my goals. I'm motivated by my husband, who deals with joint pain everyday, but no matter how bad it is, he'll go the gym and push himself. I don't think about what brought me here today, but who: my sister. It's motivating to think of her and her struggles. Motivation is a personal thing. When you find it, hang on to it and enjoy the ride. My inspiration comes from the things in life that motivate me. When I'm tired and feel unmotivated, I close my eyes and visualize my sister or her sweet son who's battling a rare kidney disease. He deals with pain without his mom by his side. That doesn't stop him from going to the gym. I'm inspired by every person in my life who has pain and suffering to deal with. I look forward to the next day. I open my eyes, get up, and head to the gym or CrossFit to beat the selfishness out of me. I plan to compete again in September of 2013. I'd really like to get my pro card one day. I don't compete for a medal only; it's a chance to display the results of my hard work. You are the only trophy and you get to go home with it every day. I developed a passion for fitness. In the future, I'd love to become a personal trainer, share my experiences, and help those who want to venture down a similar path in life. There are many people who need a gentle push onto the right path so they can move on and improve their self-esteem. Another dream of mine is to publish my own cookbook. I absolutely love nutrition. I'm very creative in the kitchen. I love cooking and creating wonderful dishes from scratch. One day, I can have a cook day with Tosca Reno, whom I admire. I love her Clean Eat cookbooks. Never be afraid to aim high. Life is so short. It can be taken away in the blink of an eye. Enjoy what you do and understand how fitness makes you feel. There's a reason for what we do. I know what mine is. What's yours? The one and only, Arnold Schwarzenegger. He's one of the great all-time bodybuilders and a wonderful actor. I really like Libby Dibiase. She's a young CrossFit athlete with amazing strength and a beautiful physique. Erin Stern is great also. I truly enjoy going onto Bodybuilding.com. My husband and I use the site to check on nutrition, supplements, and workout tips. The personal stories and transformations are breathtaking. There's so much valuable information on the website. I'm always referring this website to others. Bodybuilding.com is a great site.